Kaboodle wanted to expand their business and move into a neighbouring unit. We were booked to complete an installation on site supplying them with the best option for both their units to be protected as one. For this we recommended an upgrade to the previous system and connect the two with an app controlled solution which is fully integrated and linked to our monitoring system with Police response. Additionally, we designed and installed a new high tech 5MP CCTV system covering the internal and external of both units including motion detectors which notifies them if anyone comes within a 25 meter distance of their property. 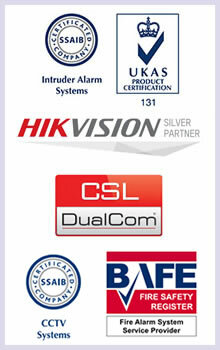 This customer also entrusts us with their fire alarm system and monitoring which we take care of and fully maintain. One of the largest glassware companies in the UK, Utopia Glasswear have recently moved into new premises in Chesterfield which is 167,274 SqFt. We were responsible for covering the full interior and exterior of the extensive unit including all racking areas. We also personally built a bespoke camera system to monitor the goods in and goods out of a separate wrapping area which consisted of 8 cameras at each wrapping. This system reads every barcode and automatically sends photographs to the customer of their goods when wrapped so the customer can see all goods leave their warehouse undamaged. There were a total of 65 cameras for this project all at 8MP using a network DVR, the alarm system in the premises is a grade 3 alarm system totally protected by motion sensors. A beam censored fire alarm was also installed with heat and smoke detectors throughout.